We’ve heard your call (and, selfishly, our own): please meet s9s - the new command line interface (CLI) for ClusterControl, our all-inclusive open source database management system. At every conference we’ve attended so far, visitors have been asking us whether there is a command line interface for ClusterControl. And, we’re not afraid to admit, some of us at Severalnines have always wanted to have one as well. So those same colleagues have gone and created the s9s CLI for ClusterControl, which we’re happy to present today. What’s the ClusterControl CLI all about? The ClusterControl CLI, is an open source project and optional package introduced with ClusterControl version 1.4.1. 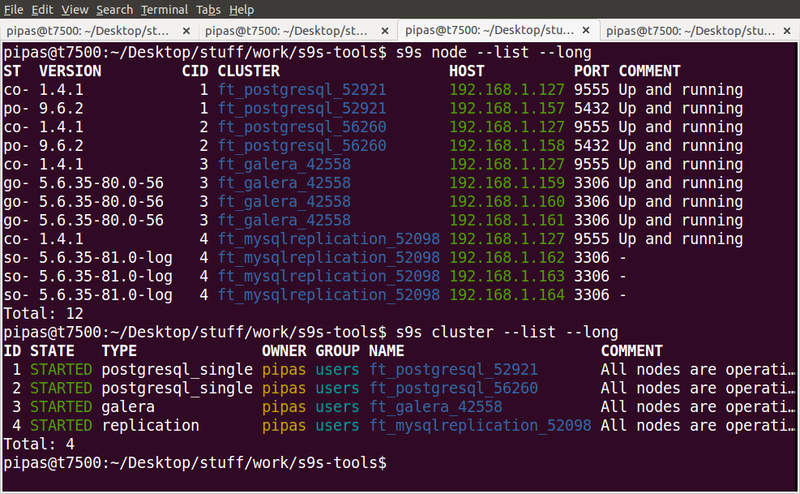 It is a command line tool to interact, control and manage your entire database infrastructure using ClusterControl. The s9s command line project is open source and is located on GitHub. The ClusterControl CLI opens a new door for cluster automation where you can easily integrate it with existing deployment automation tools like Ansible, Puppet, Chef or Salt. This allows you to easily integrate scripts from your orchestration tools inside the CLI. 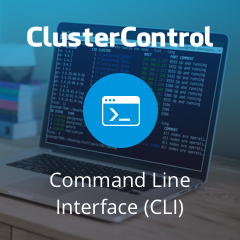 Users who have downloaded ClusterControl can use the CLI for all the ClusterControl features while they’re on the Enterprise trial of ClusterControl. Community users can then use the deployment and monitoring functionalities of ClusterControl. Existing customers can use the CLI to the full extent of ClusterControl. The CLI can be installed by adding the s9s tools repository and using a package manager, as well as be compiled from source. The current installation script to install ClusterControl, install-cc, will automatically install the command line client. The command line client can also be installed on another computer or workstation for remote management. Finally, the CLI requires ClusterControl 1.4.1 or later. Moreover, all communication between the client and the controller is encrypted and secured using TLS. The ClusterControl CLI allows you to deploy and manage open source databases and load balancers in a way that is fully integrated and aligned with the ClusterControl core and GUI. Actions you take from the CLI will be visible in the ClusterControl Web UI and vice versa. The ClusterControl CLI and GUI are fully integrated and synced to allow you to utilize the CLI for deployment and management of your databases and load balancers, whilst using the advanced graphs in the GUI for monitoring and troubleshooting. The CLI offers detailed information about node stats and cluster stats, enabling scripts and other tools to benefit from those. In our experience, System Administrators and DevOps professionals are the mostly likely to benefit from a CLI for ClusterControl as they are accustomed to using scripts to perform their daily tasks.